Rick Macomber shows us the scene on the ramp from 128 north to the turnpike, where a tractor trailer rolled over before 5 a.m. and kept the ramp shut until around 8:15. State Police report the driver suffered minor injuries. Same place, different truck in May. 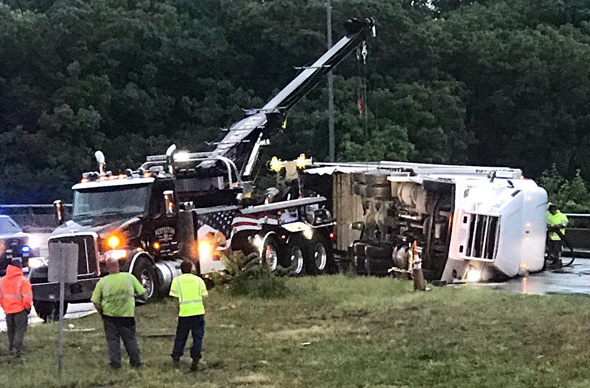 State Police report an early-morning rollover by a tractor trailer hauling frozen food shut the ramps from the turnpike to 128 and the ramp from 128 north to the turnpike. The vehicle was righted and moved out shortly before 7 a.m.
NBC Boston reports a car traveling south on Wellesley Road yesterday afternoon hit a deer - which then bounced across the road and into the windshield of a mini-van heading north, causing fatal injuries to the driver. 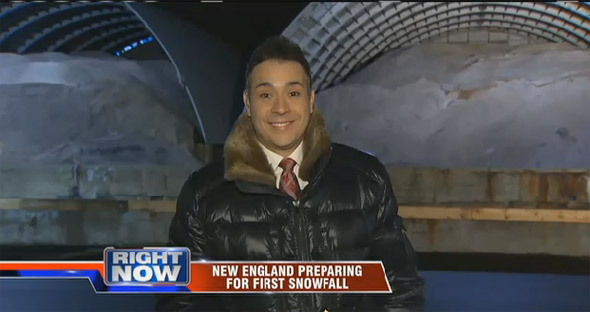 WBZ reports on what caused big delays on the turnpike from Weston back this morning. The biggest issue was the “traveling salesman problem”: trying to find the most efficient route through a large number of locations. We simulated the problem by asking each group to find the shortest path to deliver papers to all their homes (as well as a couple of other sites). Since we couldn’t have realistically large groups, we at least were able to add interest and complexity by ensuring that each group contained a mixture of Weston and Boston students. There’s no perfect general solution, but we were able to compare different options. The Supreme Judicial Court ruled today that school districts cannot withhold the financial details of individualized education programs for special-education students placed in specialized private schools - but that they can strike any information in those records that might identify specific students and their learning disabilities, such as their names, ages and the schools they attend. Read more. Dumpling Daughter v. Dumpling Girl. Nadia Liu Spellman, who opened a Chinese dumpling restaurant in Weston with the help of her mother, Sally Ling, this week sued two former workers on charges they stole her concept and some of her recipes to open their own dumpling joint in Millbury. Read more. Don't you hate it when you lose your load? State Police report the entrance to the turnpike in Weston is jammed up thanks to an 18-wheeler that spilled its load all over the place at the toll plaza. The Norumbega tower. See it larger. When you're rich, people listen to you. And you get to build monuments to wacky ideas with no proof behind them. After pieces of the truck cleared, Fitchburg Line passengers look on. Photo by Finn. Happened on 128 at Rte. 20, backing up 128 southbound and halting inbound service on the Fitchburg Line, since part of the truck seemed to have landed on the tracks, only it didn't. Boston Biker reports bow-and-arrow hunting becomes legal for the next 2 1/2 months on Weston conservation land - through which run some trails often ridden by mountain bikers. Well, this is a first. Around 7:00 or so, going inbound to Boston saw a beautiful chestnut horse running toward Boston alongside the tracks, followed by a woman running behind, followed by a panting MBTA cop. Between Silver Hill and Hastings. Train delayed for 10-15 minutes. All three none the worse for wear. At least we weren't robbed by outlaws. MBTA spokesman Joe Pesaturo reports train 406 was delayed 11 minutes as Weston and Lincoln police corraled the wayward equine. Wellesley diet not rich enough for moose? A few days after a moose ambled into Wellesley, a moose appeared in a Weston backyard yesterday. Erin reports coming across this sign this morning on Wellesley Street in Weston, near the high-school athletic fields; adds: "I almost drove off the road laughing."